Skyblivion is a project by a volunteer team of modders to recreate the map for The Elder Scrolls IV: Oblivion inside Skyrim. It's been years in the making, dating back to 2012, and the team recently released an updated trailer to showcase their accomplishments so far. Their progress will give you a new appreciation for some of the more subtle differences between how the two games depict nature. 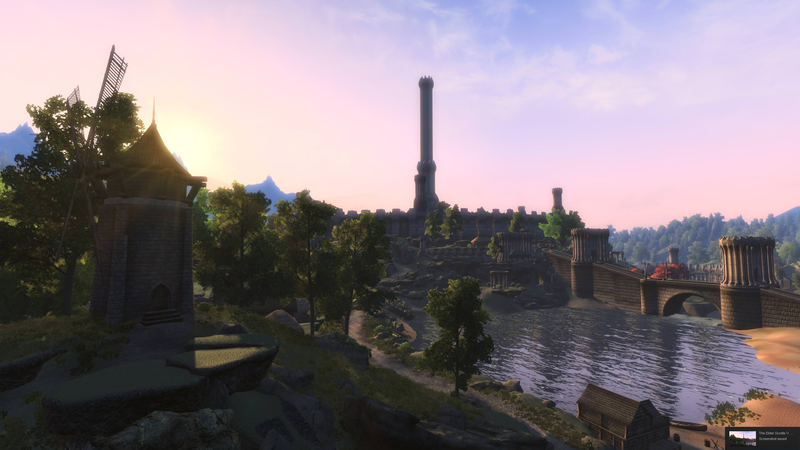 The video's main focus is on the Imperial City in Cyrodiil, the province Oblivion takes place in. "You will be able to spot new colourful weathers, new trees and flora, new clothing, new custom designed weapons, NPC schedules, remade textures and models, custom made creatures using custom behaviours and animations," the team says in the video's description. It makes sense that things are slightly warmer south of Skyrim, but the temperate climate comes through in ways that go beyond the obvious lack of snow. Complimentary colours abound — greens and reds, yellows and purples — and the vegetation filters much of the light to make the sun feel more like a comforting glow lamp than a distant fluorescent bulb. "So obviously when recreating Cyrodiil you have to look closely at the original game and supplement all the visuals there with common known lore of the different regions and biomes in the province," Kyle Rebel, the project's development lead, told Kotaku in an email. 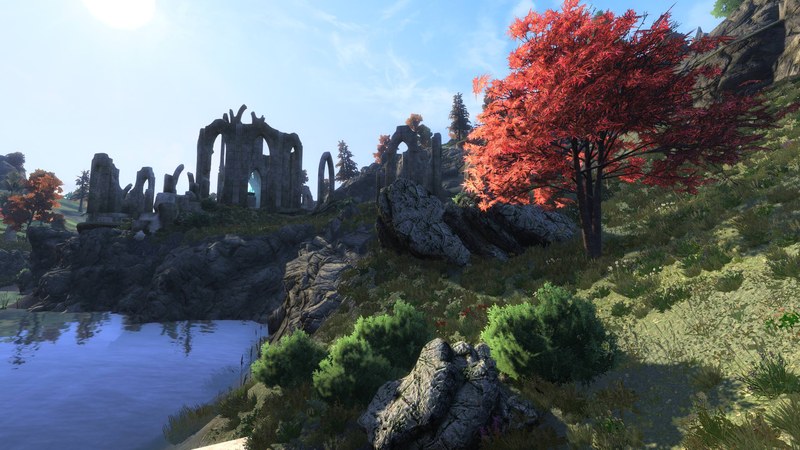 "A general rule of thumb for Cyrodiil is that the province should have a high fantasy feeling where the grass is green, the trees and bushes are lush, flowers are in bloom all year round and the temperature is always a perfect 22 degrees Celsius." The environments are verdant and borderline paradisiacal, beautiful in a way that's distinct, though not necessarily better, from the gravelly mountains and austere snowscapes of Skyrim. One of the challenges for Skyblivion (of which there are many, including working with an all-volunteer staff) is to remake Oblivion using the Skyrim engine without the former simply melding into and becoming derivative of the latter. Striking this balancing act requires, among other things, an acute attention to bushes and trees. "So let's for instance take the Heartlands which is the area all around the Imperial City isle," said Rebel. "This area is very lush and green compared to Skyrim, so instead of pine trees this area is filled with big healthy oak trees and smaller types of trees all filled with a healthy looking collection of leaves. When you look at your feet you see light green grass and little flowers here and there poking through. The bushes in the area are thick and often covered in pink, purple, white and red flowers." Rebel considers the Sequoioideae to be Oblivion's most iconic piece of vegetation, but he also has a soft spot for the maples that surround the island on which the Imperial City sits. Of course, the leaves on a red oak or the flowers blooming on a rose bush aren't anything without good lighting. "The clear sunrise behind the Imperial City that we showed in the update trailer has to be my favourite," said Rebel. "Seeing the sky turn from black to pink as the sun slowly rises is simply a wonder to look at and actually makes me question why Bethesda didn't put more time and effort into the weathers of Skyrim. There is so much that can be done with proper lighting in a game." In this regard he credits modder Stayd, the team's "lighting and weather god." 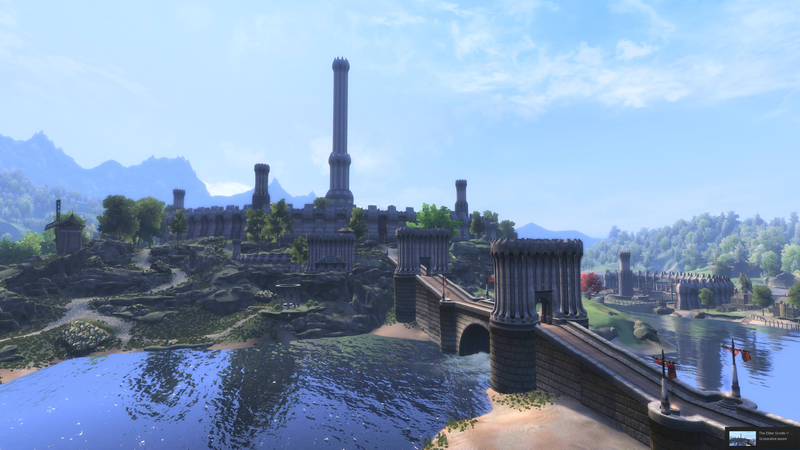 While the latest trailer looks promising, Skyblivion is still a ways off from release. A stream discussing the mod's progress is planned in the future to help raise the money needed to eventually complete the project. Although on paper that finished product is supposed to simply be a world in which the two games sit side-by-side, Rebel wants to capture the unique feel and contrast between the two different types of environments. "I personally look at Skyrim's level design a lot and real life references," he said. "We all see these amazing pictures of landscapes around the globe that just make you think ''these places can't be real, they look like they are ripped out of a movie,' which is exactly what we are trying to achieve with our work. Jaw-dropping beauty in the form of pixels on your screen." Morrowind made to look like Oblivion. Oblivion made to look like Skyrim. there have been plenty of attempts at this and i dont know if any have ever actually been released as completely playable. They will finish it, then Bethesda will release Oblivion Enhanced version.